You read that right. 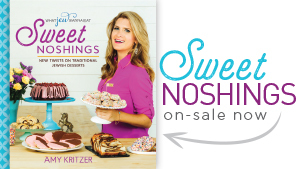 So pumped, y’all! I’ll give you a moment to let the excitement sink in. This recipe is seriously like everything magical rolled into one food. Lox. Neon Pink. Booze. If somehow Channing Tatum could be involved (perhaps hand-feeding it to me in Bali? ), then it would be over-the-top perfect. Anyhoo, my original homemade lox is super popular, so I’ve been meaning to make another variety for forEVER! Give the people what they want! Well, my friends, the time has come. And it’s worth the wait. I like to do things big. Birthdays last a month, Halloween costume planning starts in July (gotta stock up on glitter! 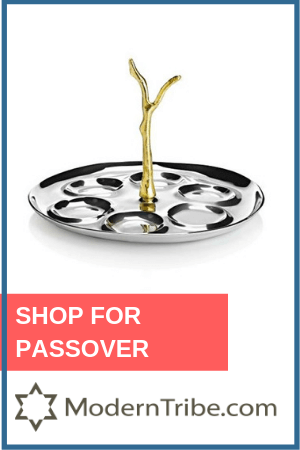 ), and post-Passover chametz is all-the-carbs. This year I totally failed and forgot to buy anything resembling bread (what a loser), but next year, I’m going to throw a carb themed party (pizza! beer! bagels!) 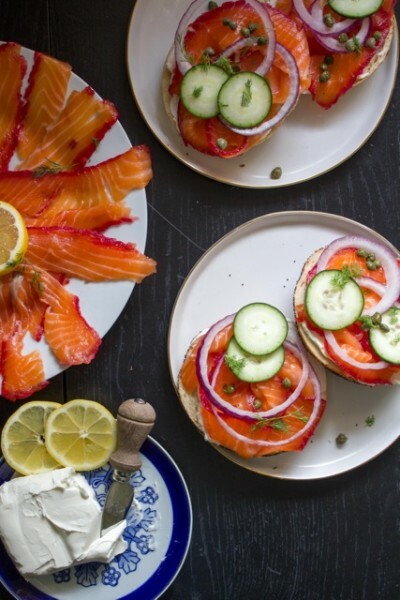 and this lox is definitely invited. 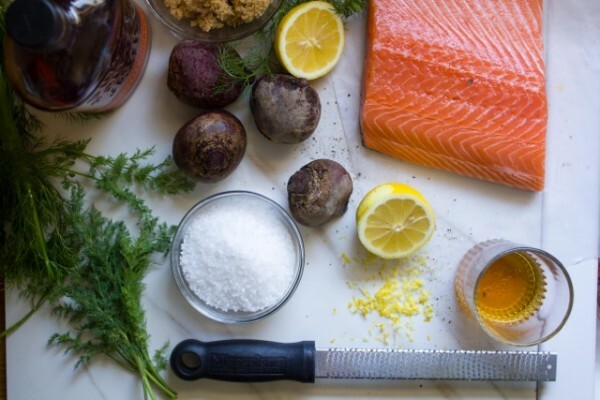 If you’ve never made your own lox before, than you may be surprised to hear how easy it is. And it’s cheaper too! But, she takes time. So if you want lox for Bagel Sunday, start curing Friday. And if you’ve never had lox before, then I’m not sure we can be friends anymore. Or maybe I should invite you over for brunch instead? Lox virgin no more. (This isn’t a sponsored post at all, but I do love me some Bulleit Bourbon.) Inspired by my recent trip to NYC. 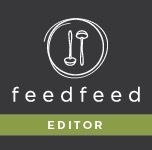 One place I really wanted to eat (but didn’t have time!) 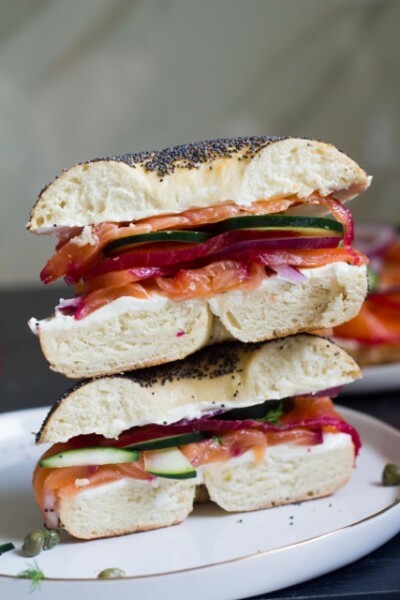 was Black Seed Bagels, known for their beet cured lox. So I made my own. And added booze! 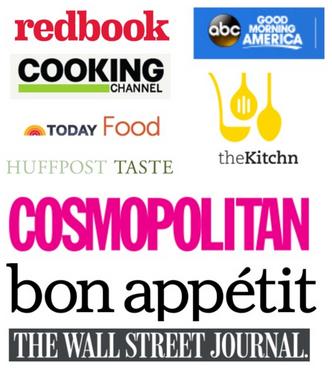 If you read my original lox recipe (go ahead, I’ll wait) then you know my spiel. 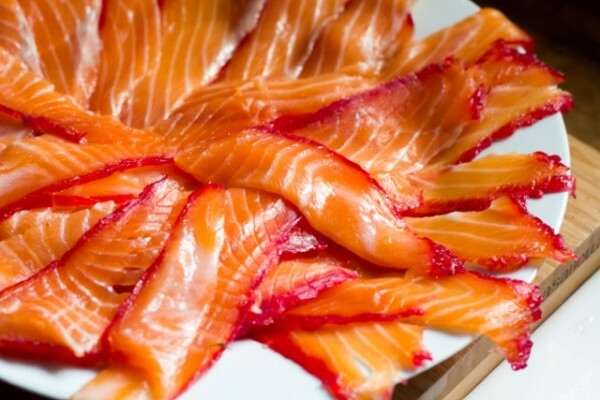 I use Atlantic salmon because it is fatty (which we want) and makes for a delicious lox. First up, check your fish for any pin bones. Those are the tiny bones along the thick side of the fish (not every filet will have them). Simply remove with tweezers or your hands if you are dexterous like that, or have your fish guy do it if you are lazy. After basting your salmon in bourbon (this helps with curing, in addition to tasting real good) mix your salt and sugar. I used a ratio of 2:1 sugar to salt. 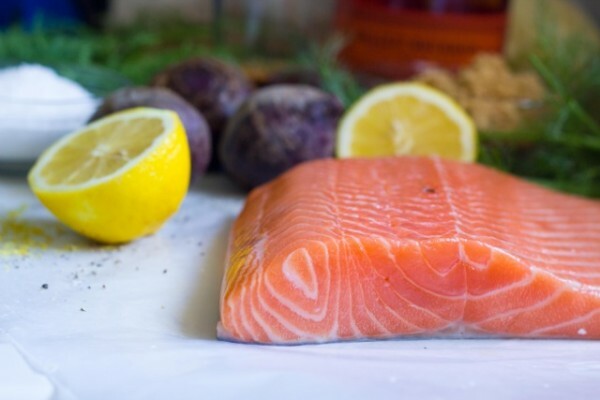 The salt does the actual curing by drawing out moisture and keeping the fish from spoiling, and the sugar helps your salmon from not tasting like pure salt. 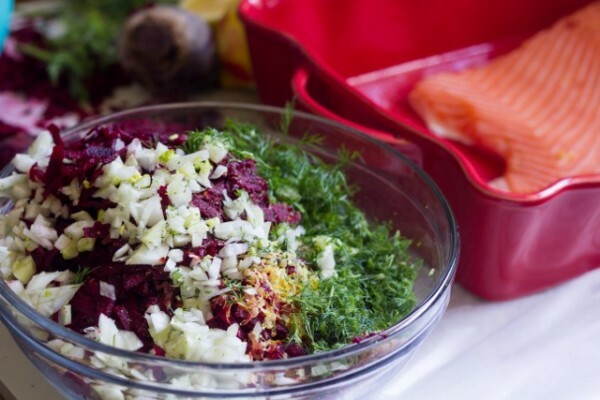 I added in shredded beets, lots of dill, lemon, and fennel. 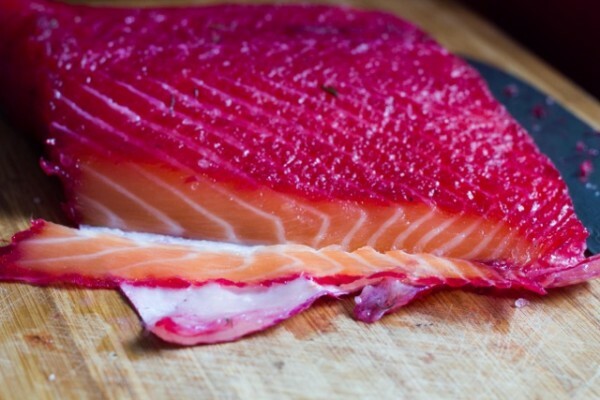 Then pack the salmon completely on both sides in the mixture and wrap tightly in saran wrap. I put the saran wrap down first, then some of the mixture, then the salmon, and then more mixture and wrapped her up. And then we wait. So impatient! Two days later, just like magic, it’s lox! Seriously, serve this at your next brunch party and set your phasers to stun. 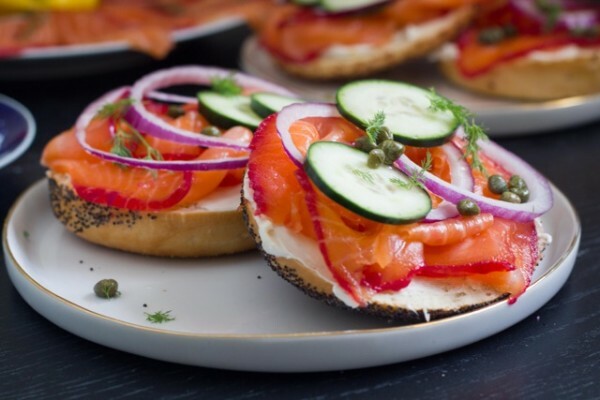 Pile on a bagel with cucumbers, red onion, capers, and just try to eat only half. Is there anything better in the world than lox on a bagel?? 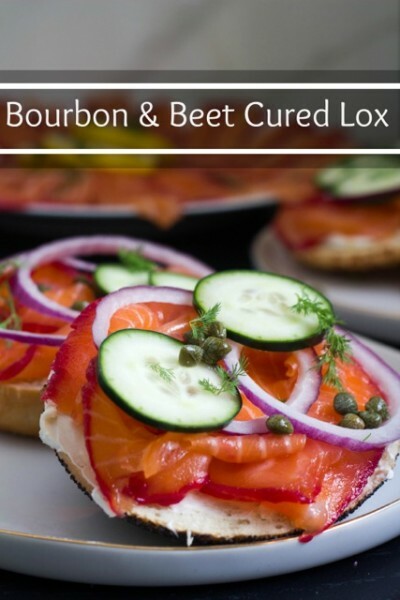 Oh I don't know, maybe homemade Bourbon and Beet Cured Lox??? (!!!) And rainbows. But that's it. First up, check your fish for any pin bones. Those are the tiny bones along the thick side of the fish (not every filet will have them). Simply remove with tweezers or your hands, or have your fish guy do it if you are lazy. 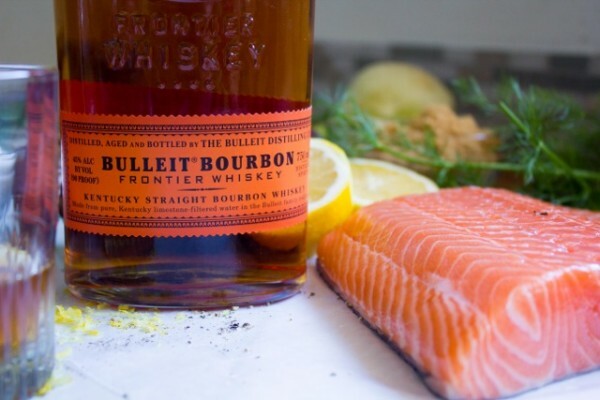 Generously brush bourbon all over fish. (This helps with curing, in addition to tasting real good) Place a large piece of plastic wrap in a large glass pan. 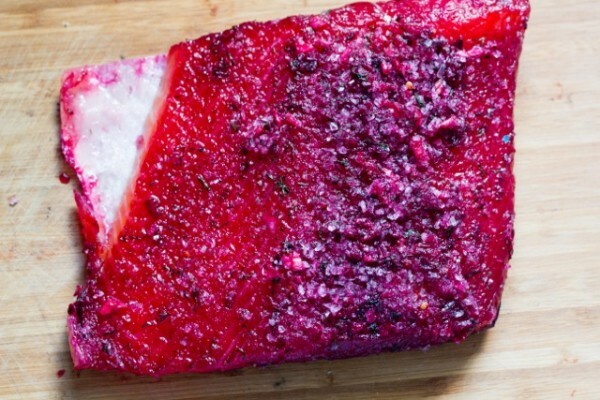 In a large bowl, combine salt, sugar, beets, dill, fennel, lemon zest and crushed red pepper flakes. Place some of the mixture down on the plastic wrap, then the salmon, and then more mixture and wrapped her up tight. Now we have to refrigerate the lox for curing! Cover the lox with a heavy object to weigh it down and prop up one side slightly so the fish juices will drain out and cure faster. After 24 hours check on your salmon. 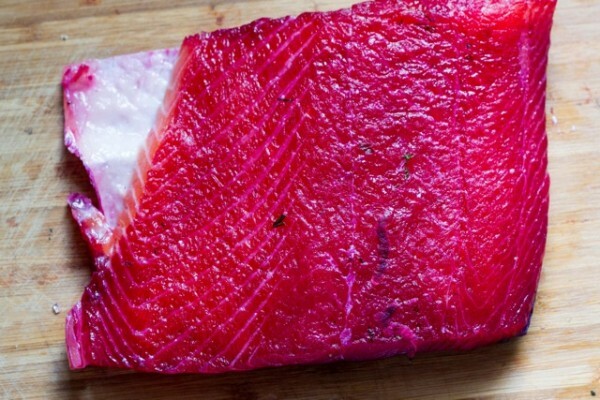 It should start looking like lox and some of the fish juices should be piling up. Drain the fish juices and put the lox back for another 24 hours. After 48 total hours unwrap the lox and wash it off well. The skin should peel off easily at this point. If it doesn’t, you can always filet it off with a sharp knife. 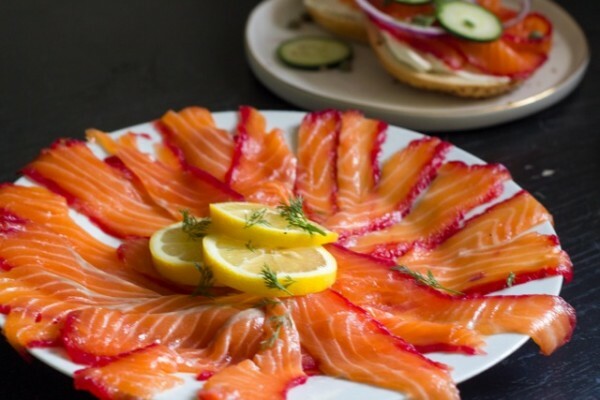 Slice off small pieces against the grain on an angle and you’ve got lox! Serve with the above accoutrements. P.S. Gomemade lox freezes really well. Tightly rap pieces in plastic wrap or vacuum seal them. 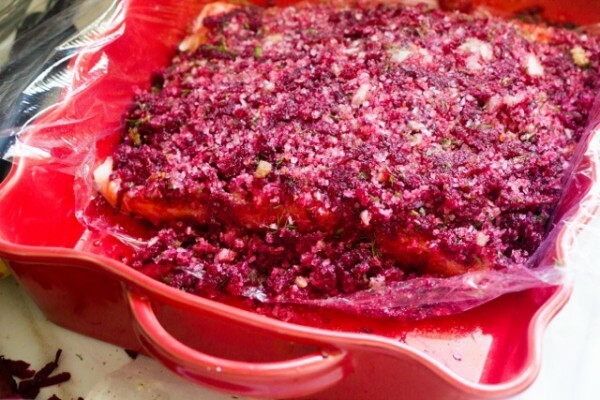 Amy, this looks amazing I love the hue that the beets leave on the outer edges ~ yum!